It’s official - more people were caught speeding by Avon and Somerset Police in 2017/18 than anywhere else in the UK. So far more than 2,100 people have shared their views about how the speed limit is working as part of a Bristol City Council consultation. Police forces across the South West are working together to stop people using their mobile phones at the wheel. The increase in law enforcement will run in line a National Police Chief’s Council campaign. It comes as figures from the Department for Transport showed that in 2016 32 people were killed in road traffic collisions where the driver of the vehicle was using their mobile phone. Whatever’s happening on your phone can wait, don’t risk it. Mobile phone use whilst driving remains one of the biggest concerns we hear about from the public. Reaction times for drivers using a phone are around 50% slower than normal driving, so put your phone out sight in your bag or on the back seat and make sure you’re focussed on the road. We’ve released a video today that shows how to put your phone into a mode that automatically lets anyone contacting you know you’re driving and therefore unable to take calls. There’s no excuse for using your mobile on the road. You could end up with points on your license and a fine, or for new drivers you could have your license taken away. Legislation introduced in March 2017 means those caught can receive six points on their licence and a £200 fine. Snowy conditions are causing trouble to drivers across the West Country. A UWE study has found that 20 minutes more travel daily is equal to a 19% pay cut when measuring job satisfaction and worsens mental health. Drivers on the M5 northbound between Weston-super-Mare and Bristol are facing long delays as emergency repairs are take place between j20 (Clevedon) and j19 (Portishead). Three lanes are currently closed, with traffic passing the scene in the remaining lane. Highways England says traffic is queuing for around six miles. Police are advising motorists to take a different route or plan. 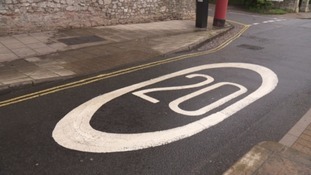 A survey analysed by professors at the University of the West of England has found that 70% of adults support an introduction of a 20 mile per hour speed limit on busy streets. Although experts warn the speed limits will only become effective once they are properly enforced. The main reasons for people supporting a change include road safety and child safety, as well as creating a more pleasant environment to live in. Wiltshire Police have announced a crackdown on uninsured drivers this week. They say 1 in 100 vehicles driven in the county are uninsured. A man has died following a collision between a motorcycle and a tractor in Cornwall. Devon and Cornwall Police say they were notified of the incident on the A30 on Saturday. The collision happened westbound between Scorrier and Redruth and involved a Harley Davidson motorcycle and an agricultural tractor drawing a trailer. A 62-year-old man from the Redruth area died as a result of the collision. Devon and Cornwall Police are appealing for witnesses to come forward. Highways England has released advice for drivers travelling south on the M5 after an incident early this morning. It says it expects the motorway to reopen "early this evening". The M5 in Somerset remains closed southbound this afternoon between J19 and J20 following a multi-HGV collision incident. "Customers should be aware there are two specific diversion routes for traffic, both routes follow the hollow circle diversion symbol. HGV traffic is advised to exit at J18. Join the A4 eastbound for approximately 5 miles, and then join the A370. Continue on the A370 southbound for approximately 14 miles to then rejoin the M5 at J21. Non-HGV traffic should leave the M5 at J19 and join the A639 eastbound for approximately 5 miles until the roundabout with the A370. Take the A370 southbound for approximately 14 miles, and then rejoin the M5 at J21. Please allow extra time for your journey should you be travelling in the area."